Alexa Virtual Device Creator is a Smartapp for the SmartThings home automation system. This application allows you to create virtual devices (Momentary and virtual dimmers, motion detectors) within the application and not requiring you to use the SmartThings IDE. A mobile device running the SmartThings mobile application. IDE: Abbreviation for “Integrated Development Environment”. In the context of the SmartThings environment, this is the web site located at http://ide.smartthings.com that allows for advanced functionality within the SmartThings environment. This allows you to set up custom devices and applications that appear within your SmartThings mobile application. Virtual Switch: A device within the SmartThings environment that functions like a regular switch (think of a button or a light switch). However, the device is “virtual” and does not exist as a physical device. While there are various types of virtual switches, three types of virtual devices can be created using Alexa Virtual Device Creator: a virtual on/off dimmer called an "Alexa Switch" and a Momentary Button Tile. Alexa Switch: A custom type of virtual switch that acts as both a normal on/off switch and as a dimmer. This type of switch can be toggled “on” or “off” and can also be set to different levels (0 to 100) of “brightness”. This type of device is useful for controlling scenarios that need distinct "on" or "off" control along with the volume of a speaker or setting different temperatures on a thermostat. This switch also sends on or off commands regardless of its state; in other words, if it is on and you tell it to turn on, it will still react within other applications as if it was off turning to on. This allows your automations to maintain control of devices regardless if they are interacted with manually or through other automation. You also have the ability to disable the capability of sending on/off commands when the setLevel action is performed. Virtual Motion Detector: A virtual device that can be manually or programmatically set to a condition (motion/no motion). This type of device is useful use in Alexa Routines where the application can act upon a change in the motion (or no motion) condition of the device. There are multiple methods to get Alexa Virtual Device Creator installed into the SmartThings environment. You can use the Community Installer, manually install the code from the links in GitHub, or use the IDE/GitHub integration within SmartThings. Simply find Alexa Virtual Device Creator in the list, and install ALL pieces of the application. If you are upgrading, click the <<Update>> button. Next, point your browser to you SmartThings IDE (http://ide.smartthings.com) and Log In. 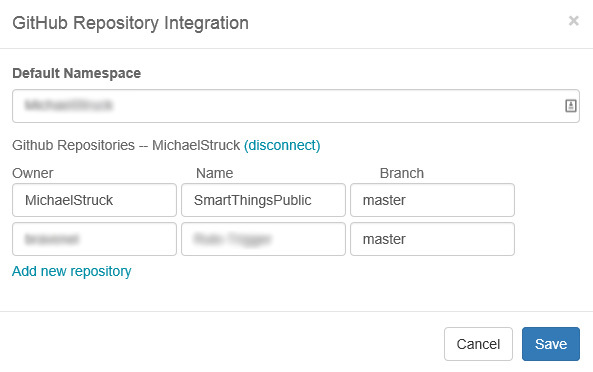 For advanced users who have their SmartThings IDE integrated with GitHub, the installation and maintaining of code becomes very simple. This manual will not go into detail about setting up your IDE with GitHub; those instructions can be found on the SmartThings web site []. Once you have integration, the for pieces of code you might need will be available to you to download and keep in sync with the latest versions. If you are upgrading from the Alexa Virtual Switch Creation the upgrade process should be rather simple. You can upgrade the code in the links above and simply upgrade the code. In addition, you can use the 'Community Installer' (http://thingsthataresmart.wiki/index.php?title=Community_Installer_(Free_Marketplace)). If you have your IDE linked to GitHub, you should also be able to upgrade the code directly through this link. You MAY notice the application name within your Mobile Interface. To change the name display, go to <<About Virtual Device Creator>> and go to the bottom of the screen to edit this text. While it is perfectly acceptable to create virtual devices via the SmartThings IDE, this is rather inconvenient when you are away from a computer. Instead, Alexa Virtual Device Creator gives you the ability to create virtual devices within the SmartApp directly. 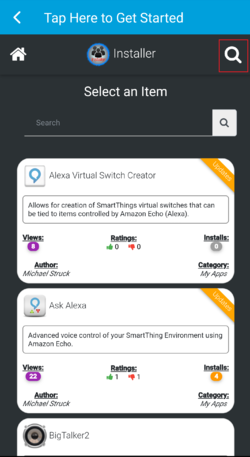 From here, you may exclusively use the Alexa Virtual Device Creator SmartApp to create your virtual devices. To create a new device, enter the name of the device in the <<Device Label>> area. Be sure to choose a unique name. Next, you will need to choose the type of device you would like to create from the <<Device Type...>> area. Currently, your choices are either a Virtual Motion Detector, Alexa Switch or a momentary button tile. The difference in the switches is explained here: Alexa Virtual Device Creator#Definitions. When you enter the above information, the <<Tap to add device>> option will appear. Tapping this area should create your virtual device. If there were any errors in creating the device they will be listed on the screen. 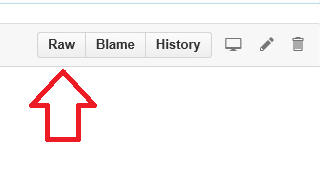 The most typical error is that you have not loaded the code properly in the above steps. Ensure the device code is saved and published properly. Clicking <<Save>> or "<" to bring you back to the main Alexa Virtual Device Creator page. If you delete the app (and the devices it created are not being used), the devices WILL disappear. If you attempt to delete the app and the devices it created ARE being used, the app will NOT delete. You will need to disassociate the devices with the apps you have attached them to. If you manually create a virtual device via the IDE, it will NOT show up in this app (but it will also not delete the device when you uninstall the app). So, you could technically use the special DTHs and create your own virtual devices. This page was last edited on 12 December 2018, at 12:24.